Demand for the Apple TV 4K has surged in the last few weeks as consumers seek ways to stream UHD content going into the holidays, claims a new report by Joshua Fruhlinger, publisher of data-driven site Thinknum. According to Best Buy sales rank data for streaming 4K devices in the month of November, the 32GB model of Apple's streaming set-top box has surpassed cheaper alternatives including the $40 Roku and Google's $70 Chromecast Ultra, placing the $180 Apple TV 4K a close second behind Amazon's market-leading $35 Fire Stick. It wasn't always this way — in fact, the Apple TV 4K has only been on the market for a little over a year. As the graph above shows, when zoomed out, the 4K race is has been a fluctuating affair. But now with the latest device revisions and 4K TV's market penetration, it appears sales are learning in Apple's direction. 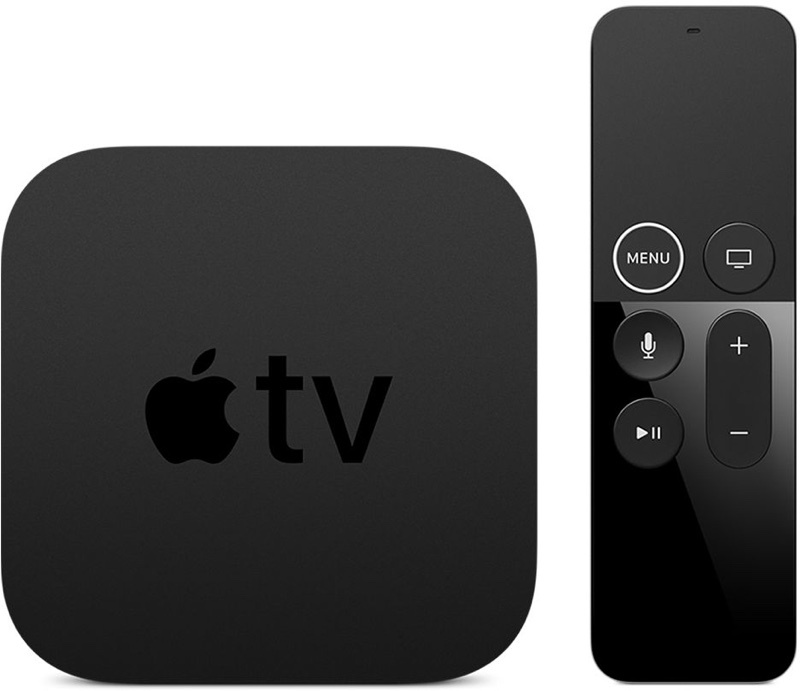 Earlier this year, Apple TV Apple brought Dolby Atmos support to Apple TV 4K, and rumors have suggested Apple is planning to roll out a streaming service next year, perhaps as early as March. On Wednesday, a report claimed Apple is considering creating a lower-cost Apple TV dongle that's similar to the Amazon Fire Stick or the Google Chromecast, a move that would aim to promote its upcoming streaming service and make it more accessible to potential buyers. Am I the only one not able to figure out the graph? Why is it all upside down and why is it so badly scaled? EDIT: Ah I see, it's sales rank. The picture could definitely use a caption. You aren't the only one. The scale is out of whack and the colors are too similar. That graph is really bad. The remote is pretty much the only reason I don't want one. I bought a 4th gen and returned it after 2 weeks back when they first launched. I know you can use the old remote which is simple but Apple really needs to re-think the next remote. The remote is so terrible. The touchpad is hard to control and unintuitive. Normal buttons would have been fine. A 3 year old can figure out how to use a Roku remote or the old Apple TV remote. Adult guests in my house just give up watching tv if they have to use the new Apple TV remote, it’s so terrible. What’s wrong with the current one? Still rocking 2x Apple TV 3rd gens, never have any issues! I just use my phone or iPad for the remote. I bought a 4K Apple TV last year to replace my aging 3rd gen and I don’t even have a 4K tv. Not much difference in price. I’m thinking on buying an apple tv do you guys recomend it? It would be nice to have more information, like what you would plan to do with a streaming device. Some basics though, unless you can find a really, really great deal, do not get an ATV4. It was under-powered at launch, and still is 3 years later. You can find an ATV3 for pretty cheap sometimes, I have seem them for $20. If you plan on using only the big streaming apps such as Netflix, Hulu, HBO, and you don't care about 4K(only a few of the streaming apps are in 4K anyways), I would say use the ATV3. The ATV3 version of Apps are much better imo, than tvOS and other modern streaming boxes. ATV3 also does AirPlay, and has much less (only at the beginning of videos) YouTube ads. While the ATV3, has an older processor, the UI is much more simple, and it is still pretty fast. I think it responds much more faster than my ATV4. Having Siri on tvOS is nice for searching, but if the apps on the ATV3 are the only ones you need, the extra money of the ATV4 or ATV4k isnt worth it just for Siri. And if so what size would you recomend? Again, this depends on you. 32GB will probably be fine for most people, but st full retail price, the 64GB is only a little bit more. I would just pay the extra amount if you plan on paying full price. I wouldn't get the 32GB at full price, it is way overpriced and sometimes you can find some decent deals. Another thought, there are some threads on this forum with people stating that it would be near impossible to fill up a 32GB ATV, and this is not true, as I have. If you download a lot of games like I have, such as 100+ games, you can fill one up. ATVs are not a problem for the TSA. Actually, when ever my wife and I travel together, we bring a bunch of "marital aids" with us. I always put them in my wife's bag just in case some thing happens, which I would find it hilarious to watch her explain what they were. But, it has never happened. I'm sure it looks funny on the X-ray though. Traveling with an ATV can be a challenge. Mine has never worked right without an internet connection, and depending on the WiFi login method, won’t be possible in some locations since the ATV does not have a web browser. When it works it’s great, but it’s still cumbersome to travel with and set up. I tend to travel with a Lightning to HDMI adapter for that reason, since I can usually plug into the HDMI cable connecting to a TV, and just plug my iPhone directly in. I’d definitely be interested in a smaller more transportable ATV dongle, but I’d be surprised if it didn’t have the same limitations for connecting with WiFi networks that the current model does. A lot of people don't know this, but you can connect your ATV to most hotels' Wifi, even if they have a browser login. You can also use AirPlay. I take my Apple TV with me when ever I travel, and I can always connect it to the corporate chains' Wifi. Every hotel room I have stayed in at least the past 6 years has instructions in the room on how to connect to their Wifi, and they all have a phone number listed on their for help. Call the number, tell the person what you are trying to do. They will ask for your ATV's MAC address, and they enter it in their system. Then just select the network name on the ATV and it will connect. Now, whether AirPlay will work, I am not sure if it will on every network, but I have used AirPlay in two place after having the Helpdesk connect my ATV, and it worked both times. Anyways, try it out, it doesn't take long. Every time I have done it, it took longer to read out the MAC address than to get a hold of the Wifi support rep as a person almost always answer the line for me and I don't have to be put on hold. I’m thinking on buying an apple tv do you guys recomend it? And if so what size would you recomend? I am not sure the 32 vs 64 is going to make a difference; that was the advice given me when I got the 32 GB version. I don't play games on the ATV. A dongle-sized, Chromecast-like Apple TV would be brilliant. Especially if it can be powered by USB from the TV itself. I'd prefer it to go bigger in size, add TV tuners and a big storage to record and time shift - basically make it a 1 TB or 3 TB TiVo. I had an itunes credit, so I rented a movie from itunes (which I never do). I was amazed by how much better the itunes movie rental looked playing through the TV app on Apple TV than any other streaming I have done. It was better than Netflix and HBO Go, which usually look great. What’s the likelihood of another promo like the DirecTV one where you got a free Apple TV when prepaying for four months of their service? I don’t want to pull the trigger on an Apple TV at full price if it’s likely to get deep discounts or an upgrade in the next six months or so.